posted: December 14, 2015 by: Kate Benjamin Tags: "Clinic Specials" "News"
Nothing marks the holiday season like decorating your home with shiny tinsel, sparkly ornaments and, of course, a Christmas tree. But when you live with cats, these festive frills can pose serious hazards, so it’s a smart idea to keep your furry family members in mind when considering your holiday decorations. If you love going all-out with holiday decor, don’t despair; you can still have a beautifully decorated home that’s also relatively catproof. You just need a little creativity and imagination. Here’s some inspiration to get you started. Of course, the most enticing holiday decoration for some cats is the Christmas tree. How can you expect kitty not to be intrigued? You just presented her with the very best possible cat tree she could ask for! You could try securing the tree to the wall, removing all the tempting decorations and doing everything else you can think of to catproof the tree, but you still may spend your whole holiday season worrying about it. Avoid that nightmare altogether with a creative substitute for the traditional Christmas tree. It doesn't get much easier (or safer for your cat) than a tree-shaped wall decal. Consider a decorative wall decal that’s easy to install and remove once the holidays are over. Bonus: No pine needles to vacuum. There are lots of beautifully designed vinyl wall decals to choose from, like a hanging ribbon Christmas tree wall decal from Pot and Kettle Studios, a Christmas tree wall decal from Trendy Wall Designs, or a Christmas tree with baubles, star and Merry Christmas decal from Pondicherry Vinyl. Another idea is to replace your traditional full-size Christmas tree with a stylish tabletop tree. These minimal, modern designs are less likely to be disturbed by a cat than a Frasier fir, and they look festive to boot. Check out the Vintermys tree decorations from Ikea, acrylic trees from CB2, and the trio of Christmas trees from Not on the High Street. For the ultimate feline-friendly Christmas compromise, try building your own climbable Christmas tree and letting kitty be part of the holiday fun! Jayne Blume of Like Kittysville designed and built a sturdy tree specifically for her cats to climb, and it’s easy to set up and take down for storage. 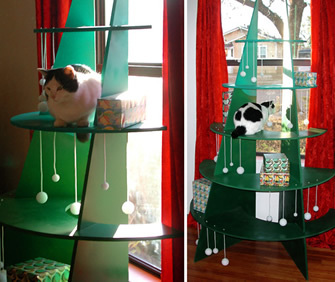 Download a PDF of the instructions for making your own climbable Christmas tree for cats. However, be cautious with your kitty on this DIY project (and any new product, really) — supervise her when she's around the tree, and if your cat tries to eat any of the string or Styrofoam balls, remove them. Shouldn't your kitty get a stocking of her own this year? When we think of holiday ornaments, we usually picture delicate glass balls, shiny tinsel, garland, strings of twinkling lights and other items that dangle and sparkle. Is it any wonder cats are intrigued by these decorations and want to play with them? Happily, there are plenty of festive holiday decorations you can actually encourage your cat play with. Hang a catnip candy cane stocking from Stark Raving Cat for kitty to bat, or fill a bowl with little holiday wool felt ball cat toys from Art Sincerely. If kitty grabs one to play with, there will be nothing to worry about. Who needs real plants when you've got cat toys like these? Several popular holiday plants and flowers are toxic to cats, causing symptoms that range from mild stomach and mouth irritation to possible death. These include holly, mistletoe, poinsettias and even pine needles. If you have any of these in your home, make certain they are out of reach of your cat. And, remember, since cats are excellent climbers, even if you think a high shelf is off limits, your kitty may find a way to get there. Instead, substitute silk or plastic flowers and greens for fresh and try to avoid using any other decorations in your arrangements that could be a choking hazard, like small sticks, beads or thin ribbons. You could even swap your traditional plants for a safer alternative that kitty is actually allowed to play with, like a mistletoe cat toy stuffed with catnip from Whimsily Ever After. Your cat will love the catnip, and you'll love the cute cookie designs. Everybody wins! Let’s not forget, the holidays are a time for indulging our taste buds with all kinds of tasty treats, but many of these foods are unhealthy or even toxic to cats. So while you're baking cookies, consider distracting your cat with a few fun, holiday treat-themed, nonedible toys like catnip Christmas sugar cookies or catnip gingerbread cookies from Miso Handmade, a sweet catnip candy cane cat from SJJ Designs, a Christmas morning donut with holiday sprinkles catnip cat toy from Fido Designs, or holiday taffy roll cat toys from Hauspanther. Feeling festive and inspired yet? How do you plan to decorate in a cat-safe way this year? Cat style expert Kate Benjamin is the author of Catification and the founder and editor of Hauspanther, the premier online magazine for design-conscious cat people. Find more of Benjamin’s feline design finds at Hauspanther.com.